Ensuring that the XML deployment file has all required components. Testing the deployment file on a test system before deploying it to the live system. Ensuring that the deployment file is loaded on the target system without disrupting the live production. Export the production from the development system. Deploy the deployment file on a test system. Ensure that the production has all required components and runs properly on the test system. If any failures are found fix them and repeat step 1. After the production has been deployed to the test system without errors, deploy the deployment file to the live system. Monitor the live system to ensure that the production continues to run correctly. You should ensure that the test system environment matches as closely as possible the environment of the live system. If you are updating an existing production, the production on the test system should match the production on the live system before the update is applied. If you are deploying a production on a new InterSystems IRIS™ installation, the test system should be a new InterSystems IRIS installation. Load the updated XML on the system. Update the running instances of the component to the new code by disabling and re-enabling the component. Creates a rollback and log file. Disables components that have configuration items in the deployment file. Imports and compiles the XML. If there is a compilation error, the portal automatically rolls back the deployment. There are some conditions where you have to explicitly stop and restart a component or the entire production. If you are using Atelier or importing the classes from the Management Portal System Explorer, then you have to perform these steps manually. To export the XML for a production using the Management Portal, open the production, click Production Settings and the Actions tab and then click the Export button. InterSystems IRIS selects all business services, business processes, business operations, and some related classes, and then displays the following form to allow you to add export notes and additional components. You can also export a business service, process, or operation by selecting the component in the production configuration and then clicking the Export button on the Actions tab. In both cases, you can add additional components to the package by clicking on one of the buttons and selecting a component. You can remove components from the package by clearing the check box. You can use the export notes to describe what is in the deployment package. For example, you can describe whether a complete production is in the package or set of components that are an update to a production. 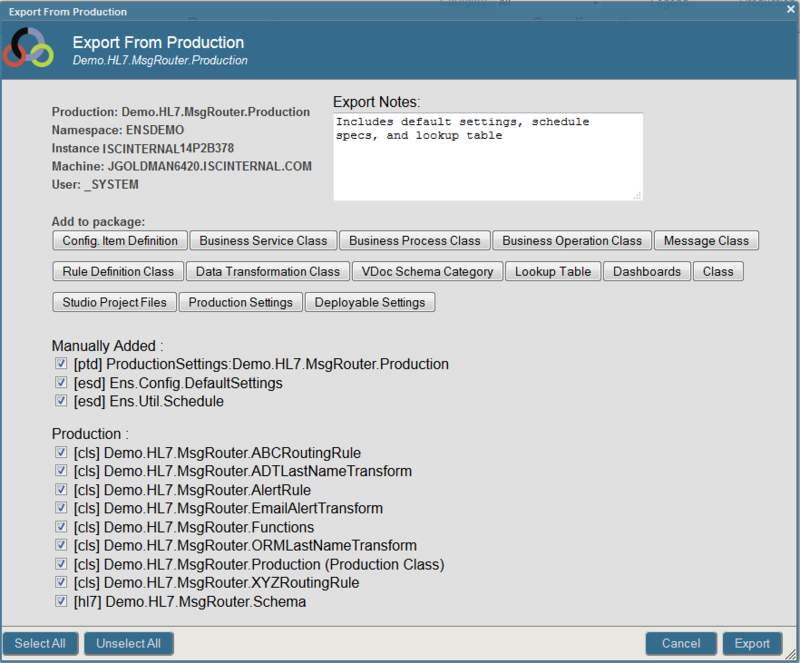 The export notes are displayed when you are deploying the package to a target system using the Management Portal. When you are exporting a deployment package, the first decision you should make is whether the target system has an older version of the production. Include the definition of the production class. Include the definitions of all components used in the production. Exclude the production settings (ptd file) for each component. This would duplicate the definition in the production class. Exclude the definition of the production class. Exclude the production settings unless there are changes and you want to override any local settings. Include the definition of all components that have been updated. Include the production settings (ptd) file for any component whose setting have been changed or that should be disabled before the XML is imported and compiled. Record mapsthe defined and generated classes are included. Complex record mapsthe defined and generated classes are included. Whether testing is enabled and whether trace events should be logged. You can deselect any component in the list by clearing its check box. You can select a component by checking its box. The Select All button checks all the boxes and the Unselect All button clears all check boxes. Once you have selected the components for the deployment package, create it by clicking Export. You can save the export file to the server or locally via the browser’s downloading capability. You should keep a copy of the deployment file on your development system. You can use it to create a new deployment package with the latest changes to the components. Keeping a copy of the deployment file saves you from having to manually select the components to be included in the deployment file. On the development system with the updated production, click Production Settings and the Actions tab and then the Re-Export button. Select the file containing the older deployment package. InterSystems IRIS selects the same components from the current production that were included in the older deployment package. If there were any components missing from the older deployment package or if you have added new components to the production, add the missing components manually. Click the Export button to save a new deployment package with the updated components. If the XML or X12 schema was originally imported from an XSD or SEF file and that file is still available, import the schema on the target system by importing that file. XSD files can be used to import XML schemas and SEF files can be used to import X12 schemas. Export the underlying InterSystems IRIS global that contains the schema and then import this on the target system. To export a global, select System Explorer > Globals, select the desired globals and then select Export. The X12 schemas are stored in the EnsEDI.Description, EnsEDI.Schema, EnsEDI.X12.Description, and EnsEDI.X12.Schema globals. The XML schemas are stored in the EnsEDI.XML.Schema global. See “Exporting Globals” in the Using Globals guide for details on exporting globals. The Management Portal automates the process of deploying a production from a development system to a live system. This section describes what InterSystems IRIS does when you are loading a new version of a production on a live system. Target productionspecifies the production that the components will be added to. If the deployment package includes the production class from the source production, then the target production is set to the source production and cannot be changed. Otherwise, InterSystems IRIS sets the default production to the currently open production, but allows you to change it. Rollback filespecifies the file to contain the rollback information. The rollback file contains the current definitions of all components that are being replaced by the deployment. Deployment log filecontains a log of the changes caused by the deployment. When you have read the deployment notes and made any changes to the deployment settings, complete the deployment by clicking the Deploy button. As part of deploying the package, InterSystems IRIS does the following to stop the production, load the new code, and then restart the production. Create and save the rollback package. Disable the components in the production that have a production settings (ptd) file in the deployment package. Import the XML file and compile the code. If there is an error compiling any component, the entire deployment is rolled back. Write a log detailing the deployment. Enable the production components that were disabled if their current setting specify that they are enabled. To undo the results of this deployment change, use the Open Deployment button to select the rollback file, then click the Deploy button.